THE STORY - In early 1970s Harlem, daughter and wife-to-be Tish vividly recalls the passion, respect and trust that have connected her and her artist fiancé Alonzo Hunt, who goes by the nickname Fonny. Friends since childhood, the devoted couple dream of a future together, but their plans are derailed when Fonny is arrested for a crime he did not commit. THE GOOD - Barry Jenkins finds beauty and poetry in his setting, his characters and the film's technical achievements. He is a true master of storytelling. Features one of the best ensembles of the year. THE BAD - Like his previous work, non-patient viewers might struggle with Jenkins' pacing and minimalism. ​Speechless. Utterly speechless. That is how I felt after watching Barry Jenkins' follow up to his Academy Award-winning film ("Moonlight") titled "If Beale Street Could Talk." It's appropriate that I should find it difficult to find the words needed to describe what Jenkins has accomplished here since it is adapted from the novel by James Baldwin. Jenkins' manages to tell a larger story than "Moonlight," saying more with still very little and saying a little with a lot. Not only has he met the high expectations we all had for him after his last directorial effort took the industry by storm but "Beale Street" also manages to retain the same level of beauty and confidence he showed in his previous work. It is a true masterwork from a master filmmaker who I truly hope we continue to receive movies from for decades to come. Where "Moonlight" told a very intimate and personal story of one boy's journey towards self-discovery as he aged, "If Beale Street Could Talk," tells the intimate and personal story of a young black couple living in Harlem during the 1970s. Clementine "Tish" Rivers (KiKi Layne) is a 19-year-old perfume department store worker with little education, in a loving relationship with her best friend since childhood Alonzo "Fonny" Hunt (Stephan James). The story opens up with Tish telling first Alonso that she will be having his baby, despite the fact that he is in prison for a crime he did not commit. Tish then proceeds to tell her mother (Regina King), then her sister and father (Teyonah Parris & Colman Domingo) and Alonso's family as well (Michael Beach, Ebony Obsidian & Dominique Thorne) even though his mother (Aunjanue Ellis) disapproves of Tish and the fact that the baby was conceived before the two were married. Tish proceeds to go through child labor while reminiscing about her relationship with Fonny and works with her family to try and free him from prison. For a story setting out to tackle many issues, Jenkins never loses focus on the central relationship between Tish and Fonny. Both KiKi Lane and Stephan James deliver extraordinary performances as the young couple struggling to make a life for themselves in Harlem New York. Jenkins opens up the story though to include other members of both character's families. Aided by Jenkins' patient style and the indelible words by James Baldwin, "If Beale Street Could Talk" features one of the best ensembles of the year. Jenkins' never shortchanges his characters, giving each a moment to shine in less than two hours of screen time. Whether it's a soul-shattering monologue on life behind bars delivered by Brian Tyree Henry, a speech on the importance of a relationship with God in the family by Aunjanue Ellis, Colman Domingo need and desire as the patriarch of his family to protect and provide for them at all costs, or the plea of a mother from one woman to another to keep her family together by the incredibly moving Regina King, Jenkins cares about each and every one of these characters. Trading in the bright Miami sunlight from "Moonlight" for warm and brown tones with deep shadows, Jenkins and returning cinematographer James Laxton continue to find poetry in the simplicities and complexities of the characters and the setting they occupy. He patiently films their movements. Their small details. He shows us their vulnerability. Their hopes. Their fears. We feel for them not just through the impeccable performances and beautifully written screenplay but through the lyrical movements of the camera as well. They continue to provide striking work but Laxton isn't the only collaborator from "Moonlight" who makes a triumphant return with Jenkins' latest. Composer Nicholas Britell manages to top his work from "Moonlight" with a jazz-infused score that evokes so many emotions and manages to feel both of its time and astonishingly modern. Tackling a vast number of issues and topics ranging from racism, the justice system, class, family dynamics and more, "If Beale Street Could Talk" is an achingly beautiful, humanistic portrait of a family trying their best to do what every person has a basic human right to do: simply live. Life is never that simple though and yet Barry Jenkins continues to dig deep into his characters and setting to illustrate harsh truths about the human condition and the world itself. Like his previous two films, you don't just watch "If Beale Street Could Talk." You get lost in it. 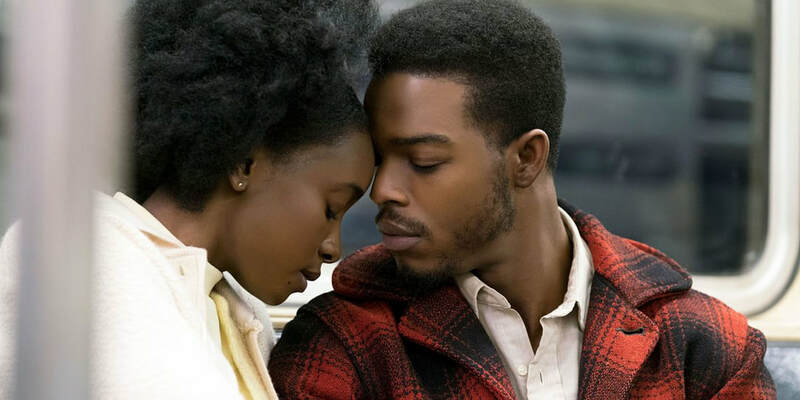 Neither a prison drama or a courtroom drama, "If Beale Street Could Talk" is instead a family drama that may be set in the 1970s but its social messages and the authenticity of the characters coupled along with the actors inhabiting them makes this story feel more timeless than ever.